These image generators will allow you to create your own graphics using both real, edited and scratch-made sprites, palettes, backgrounds, portraits, minilogos. They're useful for things like avatars (just the small ones), setting up character fights, making a group of your favorite (or least favorite) characters or just messing around. These generators share an engine that is a constant work in progress so it isn't complete or perfect. 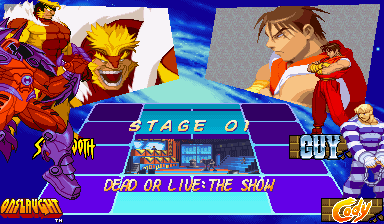 These generators use 1990s-early2000s fighting game style sprites. Nearly everything from the old Group and Vs. Generators is there with an improved engine. There are still a few things from the old version that need to be added in future updates. This generator uses graphics that are mostly from things other than fighting games. It's currently filled NES and 8-bit graphics. 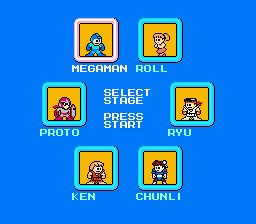 Currently includes Mega Man NES and River City Ransom screens. This generator allows you to make graphics with sprites getting ready to do battle. It currently mimics various Vs. 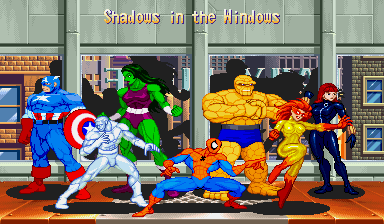 Screens from fighting games though few (currently Marvel Super Heroes, X-Men: CotA) are completely accurate yet. There are a few customized Vs. screens as well. Use this to assemble your own team of heroes, villains and everything in-between with this generator. 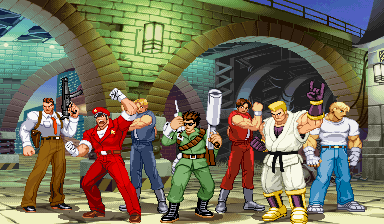 This generator lets you make a group shot using various sprites, backgrounds and effects. You'll also find a few solo graphic styles as well. Scenes include many game stages, tributes to game artwork and even toy package designs. You can even make 100 by 100 pixel avatars.